Diabetes is always about striking a balance between the demands of your daily life and your glucose levels, but twice a year there’s an extra adjustment we all have to make: when the clocks go forward or back, and we ‘lose’ or ‘gain’ an hour of our day. This Sunday, October 25th, is the end of British Summer Time, so when we wake up we can turn the clock back an hour and enjoy an extra lie-in. So far, sounds like the perfect weekend! But if you think about it, when time shifts, even by an hour, it alters your routine. You might have brunch instead of breakfast, miss your morning run, or feel extra-peckish mid-afternoon. These might seem like small changes, but if you’re not checking your glucose levels regularly, you might find you’re feeling ‘low’ unexpectedly, or discover your glucose is higher than you’d like at your next test. That’s why there’s one thing you should do before turning over for that extra hour’s sleep: adjust the time setting on your FreeStyle blood glucose monitoring device. It’s easy – just follow the steps on our website. With your meter set to the correct time, you’ll know the records of your glucose readings and logged insulin doses are accurate, and any testing alerts you’ve set will be correct too. Does winter affect your diabetes? What about the longer-term effects of the ending of British Summer Time? 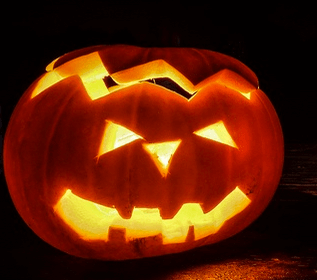 With Halloween nearly here, can you expect any scary consequences for your diabetes management? Research in the UK, USA and Sweden has shown that HbA1c in people with diabetes tends to vary from season to season, with higher levels in spring, following the winter months, and lower levels in autumn, after the summer.1 It’s not clear exactly why, but it may be that winter lifestyles play a part. With bad weather and fewer daylight hours, it’s tempting to be less active and spend more time indoors. When it’s cold outside our food tastes change too; a jacket potato and a gingerbread latte might appeal more for lunch than salad and fizzy water. Many of us tend to get into a different routine in winter – and of course, any change in routine can impact your diabetes management, beyond your HbA1c. Some aspects, such as avoiding hypos, may be easier in winter if you are eating more carbs and exercising less. But you might find your glucose levels are higher than you’d like, and if you’re often trying to correct highs and subsequent lows, they may be unpredictable too. If this is the case, testing your glucose regularly and logging your insulin doses on your FreeStyle glucose monitoring device can play a big part in helping you make adjustments to ensure your glucose levels stay within target. For example, if you’re eating larger portions to keep the cold out, testing after meals can show you the impact on your glucose, and help you decide how to manage this. Logging your insulin doses can help you see where you might want to adjust their timing. In winter you might prefer to exercise after work, rather than getting up early. Or if you love a cooked breakfast instead of fruit in winter, you may need to work with your healthcare professional to adjust your mealtime insulin dose for that. Of course, you might not make big changes like these to your daily routine. But testing your glucose regularly and logging your results and insulin doses can help you spot the effects of small shifts in habit. The trends feature on your meter can be useful here, as it can alert you if, for example, you might regularly be going low before lunch, or high after supper. As well as helping you make day-to-day decisions, your FreeStyle blood glucose monitoring device can also help you see the bigger picture of your diabetes management. By downloading the data and studying the reports, you can compare week on week, or month on month at a glance – the ideal aid for discussions with your healthcare professional about your routine. Having accurate, comprehensive information at your fingertips can help you enjoy the changing season while staying in control of your diabetes. So instead of an extra snooze on Sunday October 25th, how about using the hour to set yourself some mini-goals, such as testing more often, planning your meals or making time to review your diabetes data each month? Come the spring, you might be glad you did! Over to you: Do you find your lifestyle changes in winter and if so, how do you adjust your diabetes routine to stay in control? Let us know on our Facebook page!